June 7, 2016 – Boston, MA – The Environmental Business Council of New England (EBC) is pleased to announce that the Medfield Charles River Gateway Project and its accompanying public and private organizations is the recipient of the 2016 EBC Nicholas Humber Environmental-Energy Award for Outstanding Collaboration. This Division of Capital Asset Management and Maintenance’s (DCAMM) Medfield Charles River Gateway project includes the comprehensive remediation of soil, sediment, and groundwater at a Commonwealth of Massachusetts-owned facility. Improving on over 3 acres of uplands, wetlands and river, the scope and size of the project made it the largest environmental restoration project on the Charles River. The former Medfield State Hospital operated since the 1890s and used land along the Charles River to deposit surplus waste including demolition debris, ash, asbestos, and other waste fill related to routine operation of the hospital. The remediation planning included mediation with and input from Town officials, concerned residents, the Charles River Watershed Association and regulators. The design developed from this collaborative effort included removal of fill from the wetland, drinking water aquifer, flood plain, and riverfront area and relocation of this fill to an adjacent upland area not located in any of these sensitive natural areas. As a first-in-the-State project permitted by the Massachusetts Department of Environmental Protection for the on-Site relocation of 30,000 cubic yards (CY) of asbestos-containing fill, the project eliminated out-of-state disposal, associated traffic, and carbon emissions. Relocated fill was placed on a demarcation barrier, compacted, and covered by a second demarcation barrier, a five-foot thick cover system, and native grass and plantings. The upland area was landscaped and hiking trails were connected to restore the previously interrupted Charles River Link Trail. The final restored area provides sweeping views of the Charles River and conservation land managed by The Trustees of Reservations and Massachusetts Department of Conservation and Recreation. The project also included petroleum-impacted sediment dredging within the Charles River thereby improving riverbed habitat. Full project details will be presented at the 32nd Annual International Conference on Soils, Sediments, Water, and Energy, October 2016 at the University of Massachusetts Amherst. The wetlands were restored to natural conditions providing an additional 5 million gallons of flood storage. 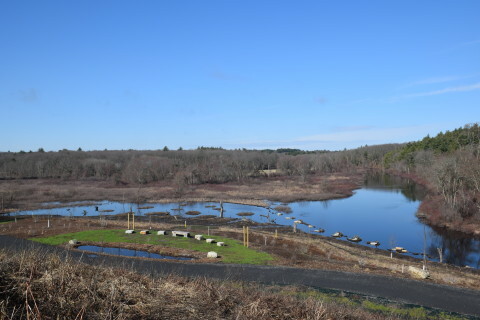 The Site now provides hiking and kayaking amenities with abundant wildlife as a benefit to all the residents of the Commonwealth of Massachusetts. The project was designed by Weston & Sampson Engineers, Inc., with landscape design by The Garden Continuum and constructed by Charter Contracting Company, LLC. The project could not have been realized without the collaboration and input from dedicated stakeholders. The Medfield Charles River Gateway Project and its primary collaborators will be honored at the Annual EBEE Awards Celebration on June 16 at the Marriott Hotel in Newton, Massachusetts.